The HLA-DRB1*0401 MHC class II molecule (DR4) is genetically associated with rheumatoid arthritis. It has been proposed that this MHC class II molecule participates in disease pathogenesis by presenting arthritogenic endogenous or exogenous peptides to CD4+ T cells, leading to their activation and resulting in an inflammatory response within the synovium. In order to better understand DR4 restricted T cell activation, we analyzed the candidate arthritogenic antigens type II collagen, human aggrecan, and the hepatitis B surface antigen for T-cell epitopes using a predictive model for determining peptide–DR4 affinity. We also applied this model to determine whether cross-reactive T-cell epitopes can be predicted based on known MHC–peptide–TCR interactions. Using the HLA-DR4-IE transgenic mouse, we showed that both T-cell proliferation and Th1 cytokine production (IFN-γ) correlate with the predicted affinity of a peptide for DR4. In addition, we provide evidence that TCR recognition of a peptide–DR4 complex is highly specific in that similar antigenic peptide sequences, containing identical amino acids at TCR contact positions, do not activate the same population of T cells. Rheumatoid arthritis (RA) is an autoimmune disease that is genetically associated with MHC class II molecules that contain the shared epitope. This shared epitope is a conserved amino acid motif (QK/RRAA) found within the third hypervariable region of the DRβ chains of DRB1*0101, DRB1*0404, and DRB1*0401. Notably, HLA-DR molecules not associated with RA (e.g. DRB1*0402) contain oppositely charged amino acids at some of these positions (DERAA). Because this shared epitope is found within the peptide-binding groove of these MHC class II molecules, it may confer the ability to selectively bind arthritogenic peptide sequences for presentation to auto-reactive T cells. The participation of CD4+ T cells in initiating and perpetuating the inflammatory response seen in RA has been well documented . The protein/peptide targets recognized by these T cells, however, have not been conclusively identified. Studies in mouse models have shown that immunization with joint derived proteins such as type II collagen (CII) and the human proteoglycan aggrecan (hAG) can induce an RA-like disease that is MHC class II restricted [2–4]. Advances in determining human MHC class II restricted T-cell epitopes from CII have been made using DRβ1*0401 (DR4) transgenic mice [5–8]. Using overlapping peptide sequences, a single dominant epitope has been characterized that has a relatively high affinity for DR4 [7, 8]. Although overlapping peptide sequences have conventionally been used to determine T-cell epitopes, quantitative MHC binding motifs that predict peptide–DRB1*0401 affinity have proven to be a valuable tool [6, 9, 10]. These predictive models have shown that specific amino acid side-chains within a bound peptide contribute to DR4 binding affinity, depending on their location within the binding groove [11–13]. Models such as these have defined a number of DR4 restricted T-cell epitopes, and may aid in determining an arthritogenic peptide. The foregoing may also help to identify molecular mimics of endogenous self-antigens that have been proposed as triggers of autoimmunity . Thus, a T-cell immune response to an exogenous microbial peptide could prime a cross-reactive response to an autoantigen [15–17]. In the case of RA, identifying exogenous and endogenous antigens that are predicted to bind to DR4 with high affinity, and present similarly to the TCR, may provide insight into how this disease could be triggered or perpetuated. We and others have reported on the development of RA soon after vaccination with the recombinant hepatitis B surface antigen (HBsAg) [18–20], and we have also shown that many of these patients express MHC containing the shared epitope. These observations have led us to hypothesize that peptides from HBsAg may activate autoreactive T cells under DR4 restriction. In the present study, we used a predictive model for HLA-DRB1*0401–peptide affinity  to: determine the number of potential T-cell epitopes within the candidate endogenous arthritogenic antigens CII and hAG, and the exogenous antigen HBsAg; determine whether a correlation exists between peptide–DR4 affinity and T-cell activation; and explore molecular mimicry between HBsAg and the endogenous cartilage-derived antigen hAG. Using HLA-DR4-IE transgenic mice , we show that a strong correlation exists between the predicted affinity of a peptide for HLA-DRB1*0401 and its ability to induce the proliferation of DR4 restricted T cells with a Th1 cytokine profile. We also show that a cross-reactive DR4 restricted T-cell response can not be predicted on the basis of peptide–TCR interactions alone. HLA-DR4-IE transgenic, murine MHC class II deficient mice were used in these experiments . Briefly, these mice express a chimeric MHC class II molecule composed of human antigen binding domains (HLA-DRA and HLA-DRB1*0401), whereas the remaining domains are mouse derived (IEd-α2 and IEd-β2). These mice were bred in a barrier facility (John P Robarts Barrier Facility, London, Ontario, Canada) and maintained at a conventional animal housing facility (Animal Care and Veterinary Services, University of Western Ontario, London, Ontario, Canada). Mice used in these experiments (male and female) were 6–10 weeks old. Peptides used in these experiments were synthesized using a solid phase peptide synthesizer and F-moc technology (Milligen 9050; Procyon Biopharma Inc., London, Ontario, Canada). Peptides used in these experiments (Table 1) include sequences from human CII (amino acids 261–273 and 316–333), hAG (amino acids 280–292 and 1786–1798), and the HBsAg (amino acids 16–33, 94–106, and 159–171). Peptides from HBsAg 16–33 that have been altered to assess cross-reactivity are HBsAg L23A and HBsAg L23A/T28R (Table 1 and Fig. 5). Structural representation of the wild-type peptides human aggrecan (hAG) 280–292 and hepatitis B surface antigen (HBsAg) 16–33, and the altered peptides HBsAg L23A and HBsAg L23A/T28R. DR4 pockets P1, P4, and P6 are the major MHC anchor positions (yellow amino acids), whereas P2, P3, P5, and P8 are solvent exposed and may contact the TCR (blue amino acids). Amino acids that differ from hAG 280–292 at TCR contact positions are indicated in red. Peptide sequences are shown from amino-terminus to carboxyl-terminus. Underlined amino acids indicate the predicted residues that interact with the MHC binding groove from P1 to P9. DR4 binding scores were calculated according to the method of Hammer et al. . hCII, human type II collagen; hAG, human aggrecan; HBsAg, hepatitis B surface antigen. DR4-IE transgenic mice were immunized intradermally at the interior side of both hind legs with 100 μl peptide (1 μg/μl) emulsified in complete Freund's adjuvant (1:1 volume ratio). Complete Freund's adjuvant consisted of 4 mg/ml heat-killed H37RA Mycobacterium tuberculosis suspended in incomplete Freund's adjuvant (both from Difco Laboratories, Detroit, MI, USA). After 10 days, mice were killed and their draining lymph nodes were removed for in vitro proliferation and cytokine assays. Cell suspensions were prepared from the draining lymph nodes and resuspended in RPMI 1640 supplemented with 10% fetal bovine serum, 100 U/ml penicillin, 100 μg/ml streptomycin, 2 mmol L-glutamine and 50 μmol 2-ME (all from Gibco BRL, Burlington, Ontario, Canada). Cells were then cultured in Falcon 96-well U-bottom tissue culture plates (Beckton Dickinson, Franklin Lakes, NJ, USA) at a concentration of 4 × 105 cells/well. Cell cultures contained peptides at concentrations of 0 μg/ml, 1 μg/ml, 10 μg/ml, or 50 μg/ml. Cultures were incubated for 4 days at 37°C in 5% humidified carbon dioxide. Eighteen hours before culture termination, 2 μCi of [3H] thymidine (ICN Biomedicals, Montreal, Quebec, Canada) was added to each well. Cells were harvested onto glass fiber filters (Wallac, Turku, Finland) and radioactivity was determined using a Wallac 1450 Microbeta liquid scintillation counter and UltraTerm 3 software. Experiments were conducted in triplicate and data are expressed as average stimulation index (decay counts per min of experimental sample/counts per min of control sample). Lymph node cells (4 × 105) from peptide immunized DR4-IE transgenic mice were cultured either in the presence or absence of peptide (10 μg/ml), as described under Proliferation assay (see above). After 48 and 72 hours, supernatants were collected and pooled from triplicate wells for detecting IL-4 and IFN-γ production, respectively. Cytokine concentrations were determined using commercially available OptEIA™ mouse IFN-γ and IL-4 capture enzyme-linked immunosorbent assay kits (Pharmingen; Mississauga, Ontario, Canada) according to the manufacturer's instructions. Purified antimouse IFN-γ or IL-4 mAb were used for cytokine capture. Recombinant mouse IFN-γ or IL-4 were used as standards, and biotinylated antimouse IFN-γ or IL-4 mAb were used as detecting reagents. All experiments were conducted in duplicate and data represents average antigen-specific cytokine production (cytokine production of control samples plus 2 SD were subtracted from the peptide-specific cytokine production). DR4-IE transgenic mice were immunized with the peptide hAG 280–292 or HBsAg 16–33 (100 μg/mouse), as described under Immunizations (see above). Ten days later, draining lymph nodes were removed and a cell suspension was prepared in RPMI 1640 supplemented medium. Cells were cultured at a concentration of 4 × 106 in 24-well plates (Costar; Cambridge, MA, USA) and stimulated with the respective antigen (10 μg/ml). After 7 days of incubation at 37°C in 5% humidified carbon dioxide, supernatants were removed from cultures and fresh medium containing recombinant IL-2 (0.01 μg/ml; R&D systems, Minneapolis, MN, USA) was added to the wells. Seven days after the addition of IL-2, supernatants were removed again and cells were restimulated with 3 × 106 irradiated (2500 rads) syngeneic spleen cells (antigen-presenting cells [APCs]) and specific peptide antigen (10 μg/ml). These T-cell lines were maintained by repeated alternating cycles of weekly restimulation with IL-2 or peptide and irradiated APCs. T-cell line reactivity to peptide antigen was confirmed (after 6–10 weeks of repeated cycles) by proliferation and cytokine production. In order to test T-cell line proliferation and IFN-γ production, 1 × 105 T cells/well were cultured in the presence or absence of peptide (10 g/ml) and 4 × 105 irradiated APCs/well. [3H]-thymidine incorporation and IFN-γ production were measured as described above (see Proliferation assay and Cytokine detection). In order to assess antigens for predicted immunogenicity in the context of DR4, we utilized the model of Hammer et al. for predicting peptide–MHC affinity. This model defines the relative affinity of an amino acid for a specific DR4 binding pocket. The sum of all amino acid contributions from each of the nine DR4 binding pockets gives a numeric binding score for a peptide's affinity. Binding scores of more than 2 are predicted to have a high affinity for DR4. Using this predictive model, we analyzed human CII, the first globular domain and second chondroitin sulfate binding domain from hAG, and the HBsAg, all of which have been implicated in RA pathogenesis [2, 18, 22, 23]. As seen in Fig. 1, the first globular domain and the second chondroitin sulfate binding domain of hAG, as well as the HBsAg contain, multiple peptide sequences that are predicted to bind to DR4 with high affinity. CII does not contain a peptide sequence that reaches a binding score in excess of 2; however, the highest scoring peptide (1.5) was 263–271, which has been shown to be immunodominant in the context of DR4 [6, 7]. DR4 binding score analysis of the endogenous antigens (a) human type II collagen (hCII), the (b) first globular domain (G1) and the (c) second chondroitin sulfate binding domain (CS-2) of human aggrecan (hAG), and (d) the exogenous antigen hepatitis B surface antigen (HBsAg). Binding scores were calculated according to the method employed by Hammer et al. .
Peptides with a range of predicted affinities were tested for their ability to activate T cells from DR4-IE transgenic mice, in order to confirm that this model identifies epitopes that are immunogenic. The selected peptides and their binding scores are indicated in Table 1. Briefly, two peptides were chosen from CII, two from hAG, and three from HBsAg, with binding scores ranging from -1.1 to +5.4. DR4-IE transgenic mice were immunized with each of the peptides and T-cell proliferative responses were measured 10 days later. Peptide sequences with binding scores below 0 did not elicit a proliferative response in these transgenic mice; however, a dose-dependent response was seen for peptides with binding scores greater than 0 (Fig. 2). When the proliferative response to peptides was compared with their binding score, a strong correlation was seen (Fig. 3a). Thus, although peptides with binding scores greater than 2 are indeed immunogenic in these DR4 transgenic mice, some peptides that fall below this range also have this property. Dose-dependent proliferative response to predicted DR4 binding peptides in DR4-IE transgenic mice. DR4-IE transgenic mice were immunized with the indicated peptides and 10 days later their lymph node cells (4 × 105) were challenged in vitro with the same peptide. Data represents the average proliferative response ± SEM of three mice for each peptide tested. This is representative of three independent experiments with similar results. CII, type II collagen; hAG, human aggrecan; HBsAg, hepatitis B surface antigen. The ability of a peptide to induce proliferation and IFN-γ production in DR4-IE transgenic mice correlates with the DR4 binding score. (a) Correlation between DR4 binding score and T-cell proliferation. Data were compiled from experiments described in Fig. 2 using a peptide concentration of 10 μg/ml and represent the average stimulation index ± SEM. (b) Correlation between DR4 binding score and IFN-γ production. Data were compiled from experiments described in Fig. 4 using a peptide concentration of 10 μg/ml and represent the average IFN-γ response ± SD. Correlation coefficients are indicated as r2. Because cytokine production by activated T cells is believed to play an integral role in the inflammatory response in RA, and because peptide–MHC affinity may dictate to some extent whether a Th1 or Th2 response is elicited , we tested the ability of the selected peptides to induce either IFN-γ or IL-4 production. Once again peptide immunized DR4-IE transgenic mice were used to measure these responses. IFN-γ production was seen in lymph node cultures stimulated with CII 261–273, hAG 280–292, hAG 1786–1798, and HBsAg 16–33 (Fig. 4). IL-4 production, however, was undetectable at any peptide concentration used. The predicted low affinity peptides CII 316–333, HBsAg 94–106, and HBsAg 159–171 did not elicit IFN-γ or IL-4 production. Similar to proliferative responses, a strong correlation was seen between the production of IFN-γ and the peptide binding score (Fig. 3b). IFN-γ production in response to predicted DR4 binding peptides in DR4-IE transgenic mice. DR4-IE transgenic mice were immunized with the indicated peptides and 10 days later their lymph node cells (4 × 105) were challenged in vitro with the same peptide (10 g/ml). 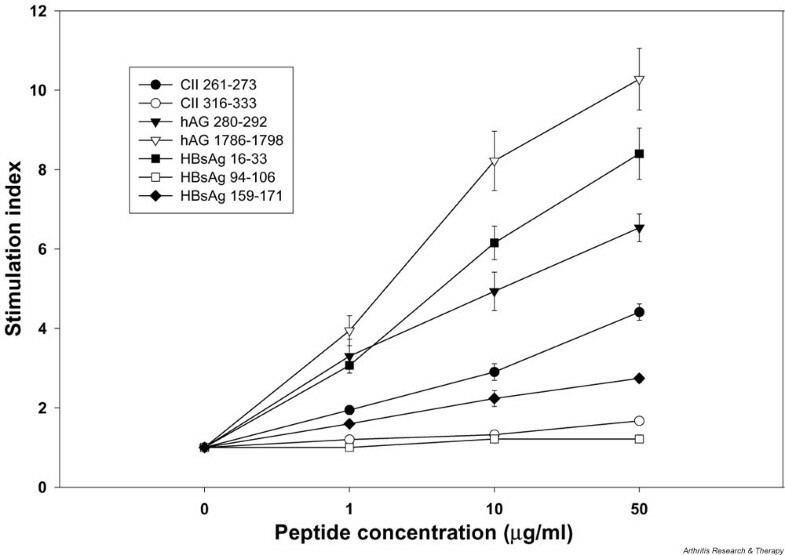 The peptides human type II collagen (hCII) 316–333, hepatitis B surface antigen (HBsAg) 94–106, and HBsAg 159–171 did not elicit an IFN-γ response. Supernatants were tested for the presence of IFN-γ by enzyme-linked immunosorbent assay, as described in Materials and method. Data represents the average IFN-γ response ± SD of three mice. hAG, human aggrecan. Because genetic factors alone cannot fully account for RA, environmental influences may affect disease expression. Molecular mimicry between microbial antigens and endogenous proteins is an intriguing explanation for triggering disease in genetically susceptible individuals. Because a specific joint derived autoantigen has not been identified in RA, it is difficult to address this hypothesis conclusively. However, using the predictive model for peptide–DR4 affinity we explored the general properties of CD4+ T cells to recognize two unique DR4 restricted candidate arthritogenic peptide antigens. Elucidation of the crystal structure of the trimolecular complex (MHC–peptide–TCR) has shown that certain amino acids from the antigenic peptides are buried within the MHC binding groove whereas others point away from this groove and make contacts with the TCR [25–28]. These TCR contact positions are found at P2, P3, P5, and P8. In light of this, we reasoned that two unique peptides, predicted to bind to DR4 with high affinity and with similar amino acids at TCR contact positions, might activate the same population of T cells. We chose to study the hAG 280–292 and HBsAg 16–33 peptides because these peptides both activate T cells in DR4-IE transgenic mice and share the same residues at the P2 and P5 positions. Because amino acids at the TCR contact positions P3 and P8 differ between the two peptides, we also synthesized altered peptides based on the HBsAg sequence. As shown in Fig. 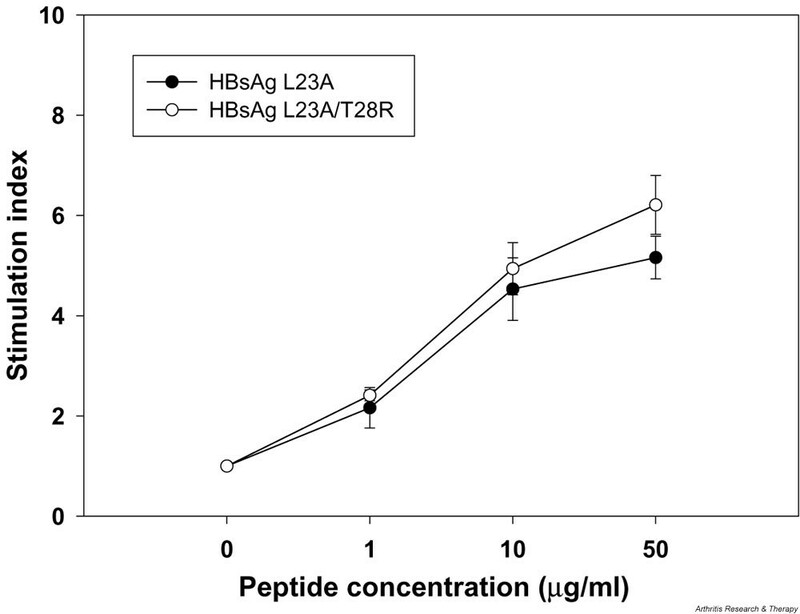 5, the HBsAg L23A peptide has the P3 amino acid substituted by the P3 amino acid from hAG 280–292, and the HBsAg L23A/T28R peptide has both the P3 and the P8 amino acid substitutions. The immunogenicity of the two altered peptides was confirmed by T-cell proliferation in DR4-IE transgenic mice (Fig. 6). Dose dependent proliferative response to the altered peptides hepatitis B surface antigen (HBsAg) L23A and HBsAg L23A/T28R in DR4-IE transgenic mice. DR4-IE transgenic mice were immunized with the indicated peptides and 10 days later their lymph node cells (4 × 105) were challenged in vitro with the same peptide. Data represents the average proliferative response ± SEM of six mice. To test for peptide cross-reactivity, we established T-cell lines from DR4-IE transgenic mice that were specific for hAG 280–292 (hAG280–292 TCL.1 and TCL.2) or HBsAg 16–33 (HBsAg 16–33 TCL.1). All T-cell lines were CD4+ and DR4 restricted (data not shown) and secreted IFN-γ after antigen challenge. 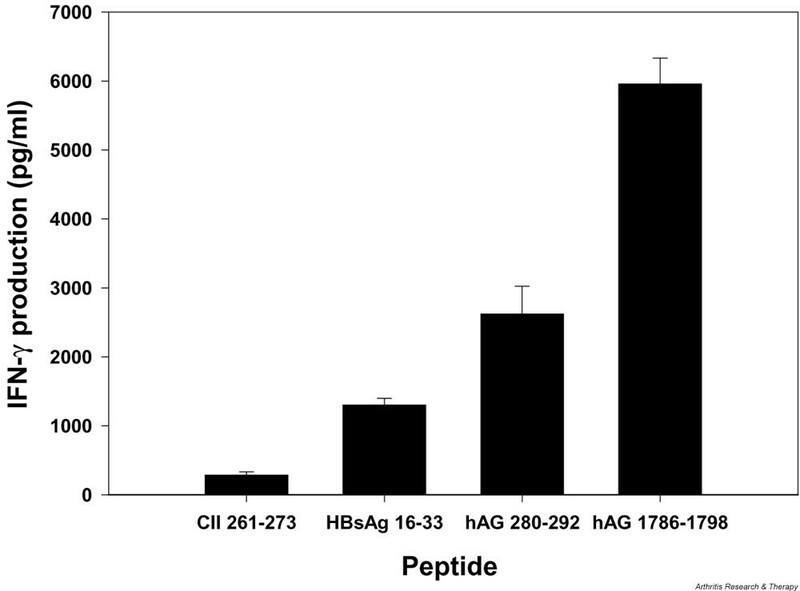 As shown in Table 2, both hAG 280–292 TCL.1 and TCL.2 proliferated and secreted IFN-γ after being challenged with hAG 280–292, but did not respond to antigen challenge with either the wild-type HBsAg 16–33 peptide or the altered HBsAg peptides. Similarly, the HBsAg 16–33 TCL.1 responded to challenge with HBsAg 16–33 but not to the altered HBsAg peptides or wild-type hAG 280–292. Thus, TCR recognition of these peptide–DR4 complexes is highly specific. Data shown are from a representative experiment showing the T-cell proliferative response in stimulation index (SI) and IFN-γ production after peptide challenge (10 μg/ml). hAG, human aggrecan; HBsAg, hepatitis B surface antigen. The role of MHC class II molecules containing the shared epitope in RA pathogenesis has remained unclear; however, they are probably involved in binding arthitogenic peptide antigens for presentation to autoreactive T cells. In the present study we examined candidate arthritogenic antigens for predicted T-cell immunogenicity in the context of DR4 using a model for peptide–MHC affinity, and we addressed T-cell cross-reactivity based on MHC–peptide–TCR interactions. We demonstrated that a strong correlation exists between a peptide's predicted affinity for DR4 and its ability to activate IFN-γ secreting T cells from DR4-IE transgenic mice. We also showed that hAG and HBsAg may be more immunogenic in the context of DR4 than CII based on the number of predicted T-cell epitopes found within these antigens. Finally, using T-cell lines specific for DR4 restricted peptides from HBsAg and hAG, we showed that TCR recognition of two similar ligands is highly specific. The predictive model used here is based on in vitro binding analysis of peptide–DR4 affinities and was validated using both random and naturally occurring peptide sequences . Assignment of a binding score greater than 2 is an accurate predictor of high affinity peptides. These encompass approximately 4% of all possible P1 anchored peptides (sequences having the required aliphatic or aromatic amino acids at the P1 anchor) found within a protein . On average there are one to three of these high affinity peptides for every 100 amino acids within a protein . 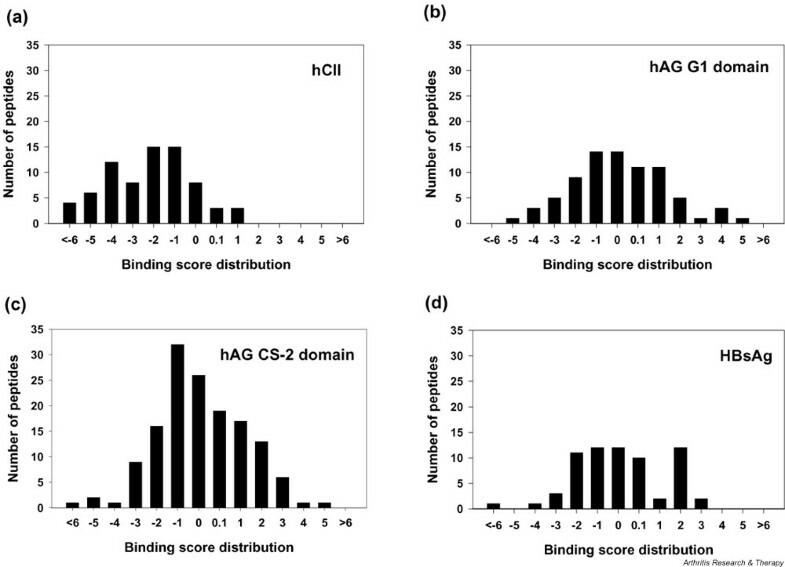 In comparing the candidate arthritogenic antigens to these averages, we found that the hAG first globular and second chondroitin sulfate binding domains fall within this average (having 2.9 and 3.2 predicted binders per 100 amino acids, respectively), whereas the HBsAg shows a higher number (6.2/100) and CII shows a lower one (0/100). It is of interest to note that there are more than 25 H-2q restricted T-cell epitopes for CII in the collagen-induced arthritis susceptible DBA/1 mice . This difference in the number of H-2q versus DR4 restricted epitopes from CII may help to explain why these DR4-IE transgenic mice (created on the collagen-induced arthritis resistant C57BL/6 background) are resistant to collagen-induced arthritis . The low number of predicted DR4 binders for CII is probably a result of its repetitive amino acid sequence, which is necessary for protein folding and function. The G–X1–X2 sequence (where X1 is usually proline and X2 can be any amino acid except for cysteine) reduces the binding score of most P1 anchored peptides from CII because glycine is an inhibitory residue at P4, P6, and P7, whereas proline is inhibitory at P4 and P9. These constraints allow for few glycine-proline combinations that will permit interaction between peptide and the DR4 binding groove. The immunogenicity of peptides predicted to be high affinity DR4 binders was confirmed using DR4-IE transgenic mice. Notably, all peptides selected had the required P1 anchor, a noninhibitory residue at the P4 anchor, and amino acids with variable affinities at P6. T-cell proliferation and IFN-γ production correlated very well with predicted MHC affinity, because all peptides with a binding score greater than 2 elicited a strong recall response in immunized mice. Two peptides selected with binding scores below 2 but greater than 0 also caused dose-dependent T-cell proliferation, one of these being the CII 261–273 sequence. This CII peptide has been shown to have a relatively high affinity for DR4 and is the dominant epitope found within CII under DR4 restriction [7, 8]. These findings emphasize that, although peptides with binding scores greater than 2 may be of high affinity, other sequences falling below this range (>0) can elicit an immune response. Although this predictive model may effectively identify peptides that are capable of activating DR4 restricted T cells, it must be noted that additional factors influence the availability of peptides for presentation by MHC class II on APCs. Included are antigen processing [31, 32], HLA-DM editing [33, 34], and post-translational modifications [35, 36], all of which are implicated in autoimmunity. In addition, some dominant T-cell epitopes have been identified that have a low affinity for MHC , an observation that increases the complexity of dissecting the immunogenicity of a protein antigen. Nevertheless, many dominant T-cell epitopes from a number of proteins are high affinity MHC binders and have been predicted as such using this model [9–11]. Because we were able to identify immunogenic DR4 restricted peptides using this model, we wished to study the rules that may govern T-cell cross-reactivity and molecular mimicry. Based on MHC–peptide–TCR interactions, we explored whether two different peptide sequences that share the properties of binding to DR4 and that presented similar amino acids to the TCR could activate the same population of T cells. The two peptides we studied were the endogenous hAG 280–292 and the exogenous HBsAg 16–33, which share identical amino acids at the TCR contact positions P2 and P5. The T-cell lines generated against these peptides showed a high degree of specificity because neither peptide was able to induce a cross-reactive response. Because amino acid substitutions at TCR contact positions can alter recognition [38–41], we also used peptides that shared most or all TCR contacts with the hAG 280–292 peptide but maintained the MHC anchor positions of HBsAg 16–33. However, even these were unable to elicit a cross-reactive response. The crystal structure of the trimolecular complex shows that the majority of atomic contacts made by the TCR are with the MHC itself and not with the solvent exposed peptide residues . Therefore, amino acid differences between peptides at the MHC anchoring positions may induce subtle changes in the MHC molecule at regions that are critical for TCR interaction. It has recently been shown that the width of the DR4 binding groove is influenced by the sequence of the antigenic peptide . This variable width is dependent on the size of the peptide side-chain residues that interact with the MHC anchoring pockets (P1, P4, P6, P7, and P9). Similar MHC class II conformational changes induced by peptides have been identified with mAbs . 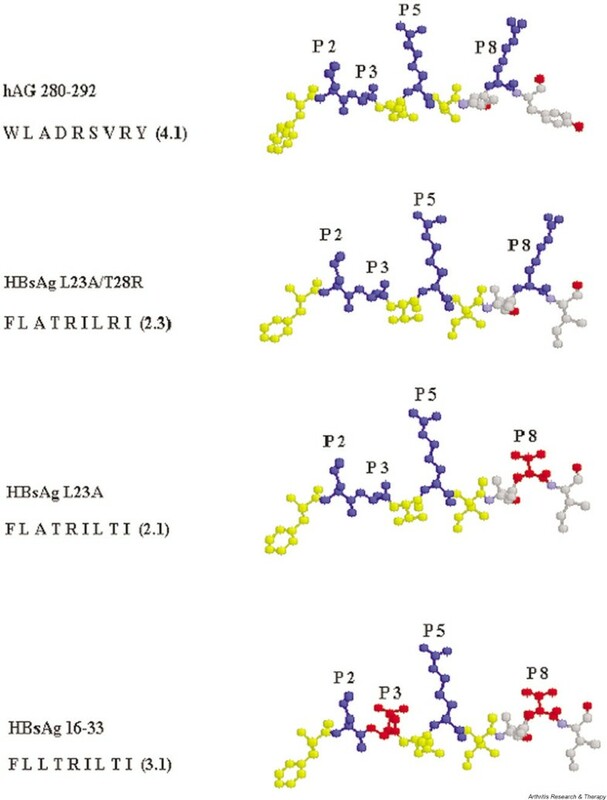 When assessing the peptides tested in our studies, differences in size were seen at P1 (W-F), P6 (S-I), and P9 (Y-I), and therefore this may have altered the topology of the MHC at regions recognized by the TCR. In addition to the altered MHC contact surface, it has been shown that a conserved substitution of the peptide side-chain interacting with P6 can essentially abrogate T-cell recognition . The substitution of E for D (removing a single methylene group) within a hemoglobin peptide bound by I-Ek induced a significant variance in the peptide main chain between P5 and P8, and changed the rotamer conformation of the amino acid at P8. Thus, subtle variations in the antigenic peptide sequence can induce a number of alterations within the peptide–MHC complex that may influence TCR recognition. The experiments presented here show that a strong correlation exists between a peptide's predicted affinity for HLA-DRB1*0401 and its ability to activate T cells in DR4-IE transgenic mice. Although we focused our studies on HLA-DRB1*0401, the emergence of new predictive matrices such as TEPITOPE (which encompasses predictions for most DR molecules) , utilized in combination with HLA transgenic mice, should help to determine the role of MHC class II molecules in the pathogenesis of RA. This study was supported by the Medical Research Council of Canada and the Internal Research Funds from the University of Western Ontario Department of Medicine and the London Health Sciences Centre. E Cairns is supported by an award from the Calder Foundation. This article is published under license to BioMed Central Ltd. This is an Open Access article: Media for any non-commercial purpose, provided this notice is presented along with the articles original URL.